Why Choose a Chiropractor for Pain Relief? uses on maintaining your health naturally to help your body resist disease, rather than simply treating the symptoms of disease. A broad range of techniques are used to locate, analyze and gently correct vertebral misalignments (subluxations) in the spine. 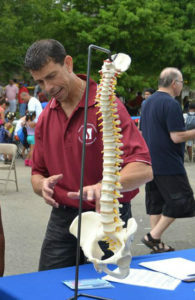 Chiropractors may use manual adjustment, electrical muscular stimulation, ultrasound or massage. But they never use pharmaceutical drugs or invasive surgery. Chiropractic is a natural method of healing that stimulates the body’s communication system to work more effectively to initiate, control and coordinate the various functions of the cells, organs and systems of the body. Want to receive more articles like this direct to your inbox?